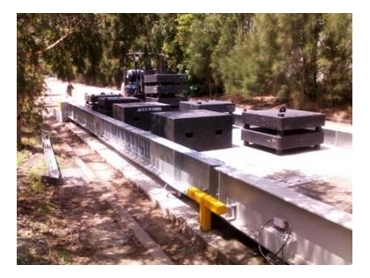 Accuweigh has installed and commissioned over 1000 different sized weighbridges in Australia. Ranging from above – ground weighbridges to concrete or metal deck weighbridges, Accuweigh also produce portable weighbridges, axle weighbridges, and in motion axle weighbridges. All of these models can be made to suit the client’s requirements. The single deck weighbridges come in a concrete deck or metal deck build and are approximately 18-20 metres long. Fitted with six weighbridge load cells, the most effective and commonly used weighbridges are these concrete deck models. The single deck weighbridges are mainly suited for weighing short trucks up to semi-trailers. Twin deck weighbridges used 2 x 20 metre weighbridge decks end to end which allow b doubles and road trains to be weighed in one single transaction. The axel group weights can be acquired for b doubles and shorter truck combinations without requiring any extension decks. The designs are available as above ground weighbridges, inground weighbridges or even semi pit weighbridges.